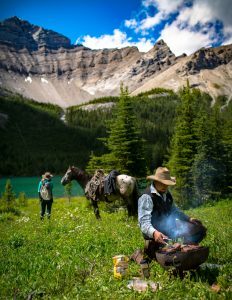 There are some truly breathtaking images that can be captured when you venture deep into the Banff backcountry on a horse. Rugged mountain scenery, lush wilderness and an authentic Old West atmosphere – all these elements offer fantastic fodder for photographs. 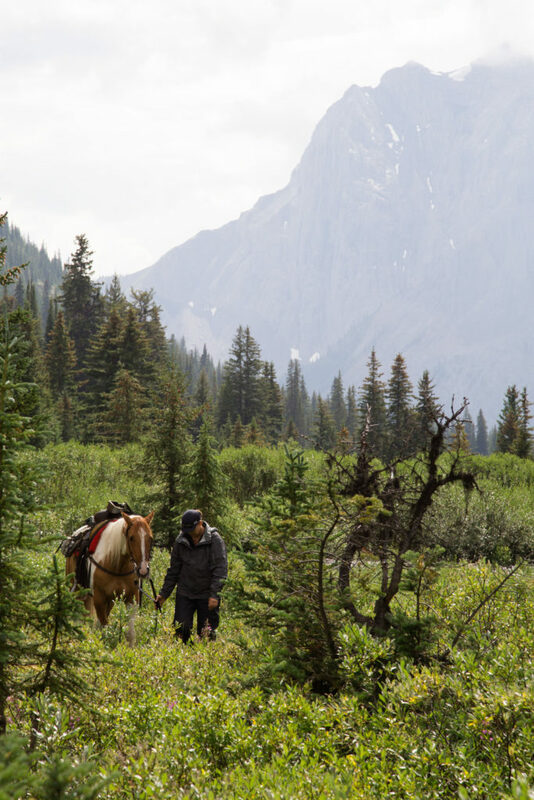 We’ve collected some of the most enthralling pictures that illustrate the raw beauty of a Banff horseback riding adventure. Even though it is only 16 kilometres from Banff, Sundance Lodge feels completely secluded from the rest of the world. The log building was constructed in 1991, near the site of the original Ten-Mile Cabin from 1923 where the trail riders heading to Mount Assiniboine used to rest. This secluded lodge is far from the noise and chaos of the modern world – the only sound is the chirping of birds and the wind whistling in the pine trees. There are no street lights to block out the night sky, so when the sun goes down you will be dazzled by a sparkling blanket of stars. 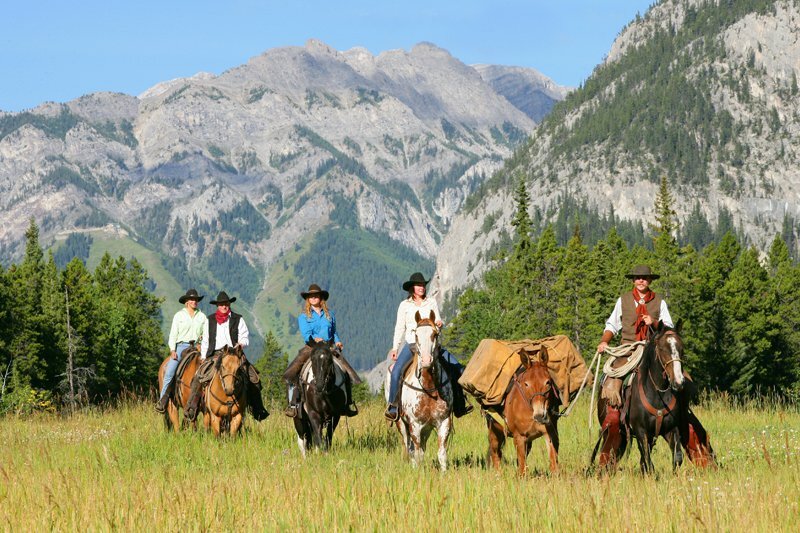 Banff Trail Riders was recently featured on an Equitrekking TV episode on PBS and on Horse and Country. Coverage included this great shot of an alpine meadow on a sunny day, surrounded by jagged Canadian Rocky Mountain peaks that fill the frame. 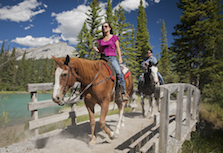 Banff Trail Riders is proud to have been featured in many magazines and front covers over the years. This one is from the June 2016 issue of Lonely Planet Traveler Magazine. The edition covered the annual Calgary Stampede and Alberta’s unique cowboy culture. This amazing river-fording photo captures the spirit of adventure that you experience on a Banff backcountry trip. It’s also a beautiful shot of the rushing Cascade River, which begins just west of Cremona and flows south all the way to Lake Minnewanka north of Banff. 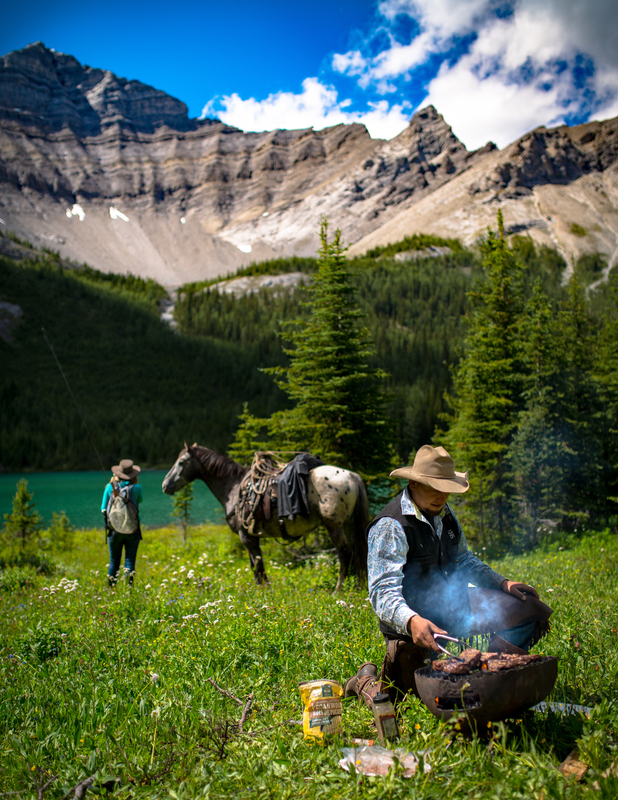 This well-framed photo shows how beautifully remote a backcountry bbq can be. It’s also an example of the type of untouched wilderness that can be experienced when you travel through Banff National Park on horseback. Mark from Rocky Mountain Photo Adventures partnered with Banff Trail Riders for a fantastic backcountry photography workshop on horseback. This photo was taken at Allenby Pass, just south of Halfway Lodge. This is part of the 6 day backcountry trip offered by Banff Trail Riders. However, Mark explains that many hikers may not have the stamina to reach these locations on foot because of the distance required while carrying heavy gear. One of the best things about going on a horseback trip is the opportunity to connect with your horse and to get to know its unique personality. It is these little moments of understanding with these beautiful creatures that can be the most tender and meaningful memories of your horseback trip. This stunning image was taken on one of Banff Trail Rider’s fall trips. The month of September is a great time to enjoy the Banff backcountry, as the weather will still be sunny and warm and the trees come alive in spectacular colours. These are just 7 examples of breathtaking scenes that can be captured when you hop in the saddle and explore the deep, wild forests of Banff. Share your favourite picture of you and a horse together.